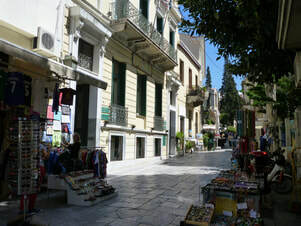 Framed by Kydathineon, Farmaki, Filomoussou Etaireias and Angelou Geronta streets, it is the main square in the heart of Plaka, the ancient quarter of Athens, known as the neighborhood of the Gods. Today, Filomoussou Etaireias Square is a main tourist attraction, crowded with restaurants and coffee shops and one can find Cine Paris, one of the oldest and best open-air rooftop cinemas of Athens, still operating. 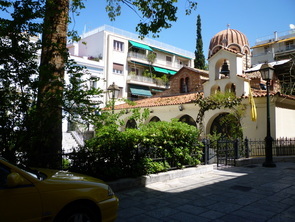 The square is dedicated to the Filomoussos Etaireia (the Society for the Arts), founded in 1813 by several men of the letters and the arts, with cultural, archaeological and educational purposes. 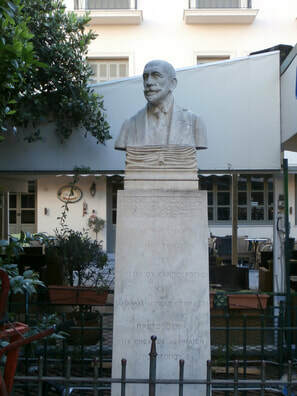 It was the first to establish a self-teaching school for boys and the first girls’ school in Athens. But at the same time it used to financially support teachers, it funded scholarships for studies abroad, assisted with the finances of poor students, undertook the translation and publishing of classical writers, considered the founding of a Museum, funded and oversee archaeological excavations, while members of the society guided foreign visitors to Athens, closely monitoring their whereabouts in order to prevent the smuggling of antiquities. ​In order to fulfill its purposes, the Society was funded by prominent members of the Greek society, but also foreign –mostly British–dignitaries and royalties such as the King of Bavaria, the Prince of Prussia, the Duchess Maria of Weimar the imperial couple of Russia, the Duchess Catherine of Oldenbourg, and others. The society was suspended when the Turks briefly recaptured Athens in 1827, during the War of Independence. On the square itself, we recommend Palladian Home, housed in an elegantly renovated neoclassical building, offering tastefully decorated rooms and suites with free WiFi access. Fitted with high ceilings, antique-like furnishings and soft colors, the rooms and suites have anatomic mattresses, a flat-screen TV and a telephone. The modern bathrooms come with walk-in shower, branded toiletries and a hairdryer. 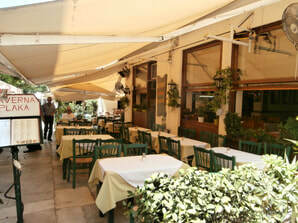 Some units open out to a furnished balcony overlooking the Acropolis or the square and the pedestrian streets. A variety of restaurants, bars and shops are just steps from the property, while the Acropolis of Athens can be reached within a 10-minute walk. Couples, in particular, like the location – they rated it 9.8 for a two-person trip. Syntagma Square is 701 m away and the New Acropolis Museum lies within a 5-minute walk. 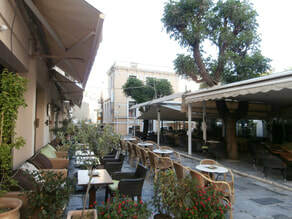 The lively Koukaki district can be reached within a 15-minute walk. ​​As a young kid I used to play with my friends in this little square, since our home used to be on Agia Ekaterini square, a few yards away, and my father's small publishing house used to be on Angelou Geronta Street, on one of the square's defining streets. Several stores, mostly street food and tourist memorabilia line the streets of the area. Make sure the souvenir you decided to buy for your loved ones back home as a reminder of your trip to Athens is not made in China. There are quality products, of high taste hand-crafted or manufactured in Greece, but one needs to find them. 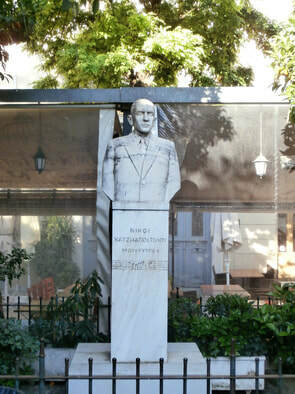 On the center of the square one can see, among motorcycles, garbage bins and restaurant paraphernalia that have illegally taken over the public space, the bust of Demetrios Kampouroglou (above) by Nikolaos Georgantis and that of Nikos Hatziapostolou by Nikolaos Pavlopoulos. 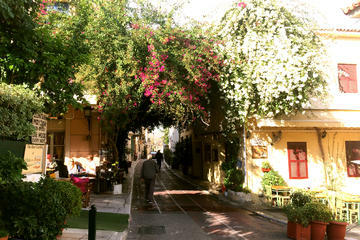 In the shadow of the Acropolis, past classic temples, Roman monuments, Byzantine churches & through the small streets of the Plaka, this tour combines a walk through the vibrant heart of the old city with regular stops to sample, experience & learn about the many local tastes, traditions & crafts which link the past with the present habits of modern daily life in Greece. Exclusive to your group, a fun, insightful and unique tour which will greatly enrich your experience and discovery of Greece bringing to life its living history & many of its inhabitants along the way. 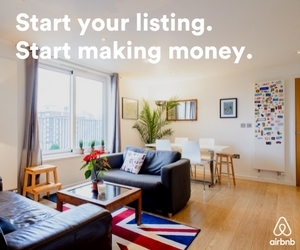 Suitable for families & all ages, with the flexibility to go at your own pace.